Little Cindy Lou Who, was no more than two, was the cute little Who who awoke to find the Grinch in her house in Dr. Seuss' classic story, How the Grinch Stole Christmas. That evil Grinch stole her candy cane (and everything else from the house), lied to her and sent her back to bed. Taylor Momsen played the character in the 2000 movie and June Foray voiced the character in the original 1966 TV show.Here's more information about this cute character from the popular Christmas story. Little Cindy Lou Who is one of my favorite characters in the classic story, "How the Grinch Stole Christmas." This little tyke climbed out of bed after the Grinch had tiptoed into her bedroom and stolen all the little Who's candy canes, and then she bravely confronted him to find out why he was stealing her Christmas tree. Of course, the Grinch thought up a lie, and thought it up quick, but little Cindy Lou Who nearly derailed the ol' Grinch's plan to steal Christmas. Go, Cindy! If you've never read the original story or seen the original 1966 animated program starring the voice of Boris Karloff as The Grinch, go do it! Taylor Momsen was born July 26, 1993. According to Wikipedia, she began acting professionally at age three, with a national commercial for Shake 'N' Bake. She later landed a role in 1999 movie "The Prophet's Game" before being cast in the role of Cindy Lou Who in the 2000 live action movie version of "How the Grinch Stole Christmas." The 2000 movie starring Jim Carrey as The Grinch adds a number of elements to the story that never appeared in the original story, but they kept the character of little Cindy Lou Who. How Smart Was Cindy Lou Who? Was Cindy Lou Who really fooled by The Grinch? Of course, silly! She believed every word The Grinch said. Maybe. But I think she was a little suspicious he wasn't the real Santa. No way! She just went back to bed because there was a creepy guy in her house! What kind of person steals candy from a baby? The Grinch, of course! Here's a video with the classic theme song from one of the best family holiday movies of all time. 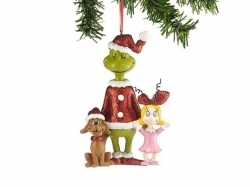 Our family has a Grinch doll - and we love it! What a fun and creative lens. I am adding it into the sidebar featured lenses widget on my Dr. Seuss lens. 5 CindyWhos and a featured lens for a great lens. What a great idea for a lens. Enjoyed it very much. 5 stars. I LOVE being the first to give 5 stars because I know what it's like to work hard on a lens, and then wait for feedback. 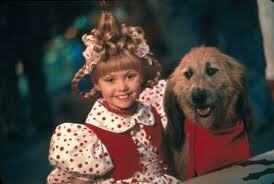 Cindy Lou is the cutest Who in Whoville!